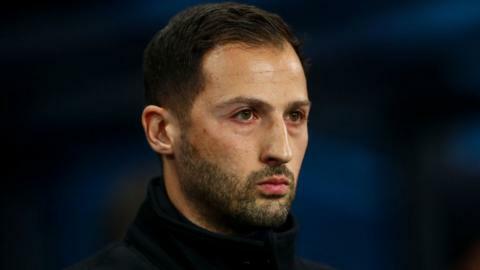 Schalke dismiss manager Domenico Tedesco following their 7-0 thrashing at the hands of Manchester City in the Champions League last 16. Manchester City thrash Schalke in the second leg of their Champions League last 16 tie to confirm their passage to the quarter-finals. Schalke warm up for Tuesday's Champions League second leg with Manchester City by conceding at least three goals for a fourth game in a row. The Manchester City fan assaulted following their Champions League win over Schalke is now "awake" and could return home within 7-10 days. Manchester City boss Pep Guardiola says his side are "not ready to fight for the Champions League" after conceding twice and having a player sent off in their 3-2 win over Schalke.